The group is, therefore, asking its members across the country to proceed on an indefinite and total strike action from Wednesday, September 20, 2017 if government failed to meet its demand. It said it tagged the planned action – Operation Alligator Bite because it would be more severe than the Operation Python Dance launched by the Nigerian army in the South-East. The group, in a letter titled, “Looming Nationwide Industrial Action: Request for Audience,” and signed by its National Chairman, Joy Josiah, and the National Secretary, Ekpebor Florence, also demanded an audience with President of the Senate, Dr. Bukola Saraki and the Speaker, House of Representatives, Yakubu Dogara on Wednesday and Thursday, respectively. Recall that resident doctors had equally embarked on nationwide strike over the federal government’s failure to equally meet its demands. Although the federal government has been trying to reach an agreement with the doctors to return to their hospitals, the strike embarked upon by the resident doctors has adversely affected, especially, patients at various hospitals very negatively. Patients had cried out to the government, pleading that the demands of the doctors be met so that they can resume duties and treat them of their ailments. However, with JOHESU threatening to join the fray, the health sector definitely will suffer major loses. JOHESU, in the letter to the legislature, is seeking an intervention to avert the planned strike which it said would definitely affect the health sector adversely. 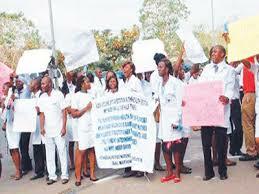 According to the statement, “We write on behalf of the leadership of Joint Health Sector Unions and Assembly of Health Care Professionals, a body which makes up about 95 per cent of health workers and health care providers, to seek for your intervention in the protracted demands and agitations between JOHESU and the Federal Government since 2014 by granting us urgent audience on Wednesday, September 13, at 10 a.m. or any other date not later than a week before September 20. “We are compelled to seek for your intervention so as to avert indefinite industrial action in the health industry. We are aware of the sensitive and important nature of our service to human lives, hence our proactive measure in prevention rather than curative. “JOHESU is aware of your recent laudable role in intervening and resolving of the issues of the medical doctors while they were on strike.